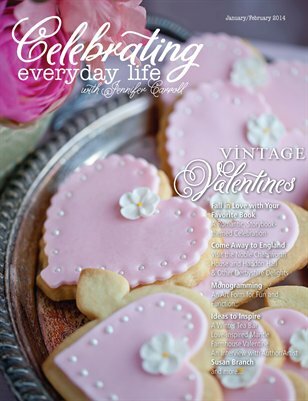 In this issue we have gathered projects and recipes which we hope will make this your most romantic Valentine's Day yet. From baking to crafting, sewing to decorating, there is sure to be something to delight you and your sweetheart. Join us for a fantastical "Storybook Love” retreat, a journey to Merry Old England to visit the Noble homes Chatsworth House and Haddon Hall & Other Derbyshire Delights. We also sit down for a chat with author and artist Susan Branch, who shares her art and her own English adventures while writing her latest bestseller: A Fine Romance, and much, much more!